Your washer and dryer might be the hardest-working appliances in your home. Every now and then, both need a little TLC. 1. You’ve just washed items either soiled with bodily fluids (blech), cooking oils, or products containing petroleum derivatives (including topical medications, lotions, and creams) OR which have worn or used recently by someone who is sick. Body fluids and sickness call for sanitization and/or disinfecting. Run your machine empty for one full cycle using the hottest possible water (140–150°F) with about one cup of chlorine bleach. Newer machines might have a sanitize cycle built in (that means super-hot water), but, if you don’t know for sure that the water temp will be at least above 140°F, add chlorine bleach or other laundry disinfectant just to be safe. For top-loading machines, allow the drum to fill, add a disinfecting agent, let it swish around for a bit, then turn the machine off to soak for about an hour before completing the wash cycle. For front-loading machines add bleach to the dispenser as you normally would. To de-oil or degrease a washing machine, run empty with either a detergent-containing bleach or detergent/bleach combo. 2. You live in a region with hard water (water high in minerals that can leave lime scale and other damaging deposits behind). Those deposits build up in the inner workings of your machine and pipes, causing wear and tear and less efficient and effective cleaning. To remove hard-water deposits, run your machine empty with hot water plus a cup or so of either white vinegar, lemon juice, baking soda, or a commercial solution (such as CLR) specifically formulated for removing calcium, lime, rust and other deposits. For top loaders, fill then add your preferred solution as described above; for front loaders, make a solution with water first, then add to the drum before running. 3. You forgot to promptly move a load of laundry from washer to dryer, allowing perfect conditions for growing mold and mildew. To prevent mold and mildew from ever starting, sanitize at least once a month following instructions above and get in a habit of leaving the door of your machine open when not in use so the inner workings can air dry. 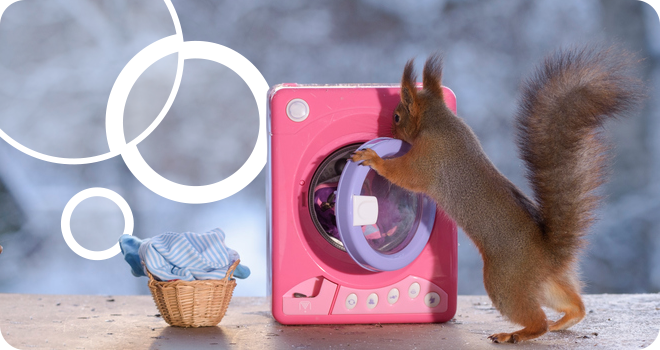 In all cases, once the washer drum is clean, take out and hand wash any removable parts such as lint screens and soap dispensers. For top loaders, release and lift the top of the machine (if possible) and hand clean around the top of the drum. For front loaders, use an everyday household cleaner to gently scrub both the inside of the door and the rubber sealing gasket around opening to the drum (be sure to get into the nooks and crannies). Finish by using a basic surface cleaner on the outside of your machine to remove unsightly lint, detergent spills, etc. Especially with loads washed in only warm or cold water, you can’t always count on a wash cycle to remove all traces of laundry contaminants. Any time your washing machine needs to be sanitized or disinfected, so too does the inside of your dryer. Even if sanitization or disinfection is not needed, it’s a good practice to clean your dryer every so often to remove trace residues of detergents and other laundry chemicals. To sanitize or clean or dryer. Make a solution of water with chlorine bleach or other laundry sanitizing solution. Wearing rubber gloves, dip a clean sponge or rag into the solution, wring, then thoroughly wipe out the drum, inside of the dryer door, and any rubber sealing gaskets. Rinse with clean water only to completely remove solution residues. Clothes dryers are also responsible for nearly 15,000 home fires each year, according to stats from the National Fire Protection Association. About one in four of those fires starts with a failure to keep ventilation systems clear of lint. Even if you religiously clear your dryer’s removable lint screen, some lint passes through with each load, collecting either inside the dryer or in its ventilation tube. To minimize fire hazard, unplug and thoroughly clean all lint-venting equipment at least twice a year. This includes unscrewing and removing the back of the dryer and hand clearing or vacuuming internal ducts where flammable lint sits closest to the dryer’s heating elements. When a venting tube’s interior walls are completely coated with lint, it’s time to replace it.